Meet Bracken, one of the many cubs orphaned and unfortunately only one of the very few rescued at this time of the year. We can but guess the exact number of badger cubs orphaned when their mother is snared but with almost two decades of intense legal snaring by the Department of Agriculture, the number certainly considered to be substantial. The two cubs were found lying in a field. One was already dead. Perhaps the result of a disturbed sett and the cubs were probably dragged to the surface by dogs. The whereabouts of the mother - unknown. More than likely she also succumbed to whatever tragedy that befell this little family. The surviving cub was under 6 weeks and still totally helpless. 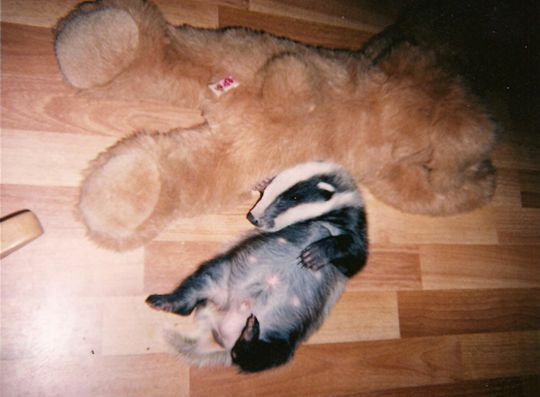 When Bracken was given to Badgerwatch he tiny and we could hold him in the palms of our hands. As with all new cubs, he was taken to the vet for a general check over. Previous cubs were bottle fed with ‘Lactol’ but this time it was not available so the alternative was ‘Welpi’ which did the job. In no time he weighed a healthy ten pounds. Baby oil was applied daily to his skin which would otherwise become dry. Severe colic also due to change in feeding (from mother’s milk) caused two emergency visits but after that he was fine and has thrived. He is now a boisterous youngster who spends hours exploring house and garden. By September he’ll be ready for release back to the wild. 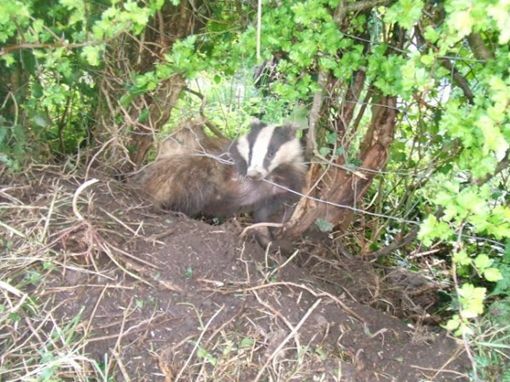 Before releasing, all badgers are routinely tested for Tuberculosis. Scotland officially declared Bovine TB-Free. This was achieved without killing a single badger. On 8 September 2009, Scotland became officially tuberculosis free ( OTF) as recognised by Commission Decision 2009/761. OTF status is recognition of the low and stable incidence of Tuberculosis ( TB) in Scottish Herds and the high standards of animal welfare. In order to maintain this status, it was necessary to put in place additional control measures for movements into Scotland, these have now been finalised and are set out in the Scottish Government OTF Implementation Plan. New legislation has been put in place to support these arrangements which will take effect from 28 February 2010 with the introduction of The Tuberculosis (Scotland) amendment Order 2009 which comes into force on that date. Calves less than 42 days of age. bTB Isolation units in Scotland which permit Irish imports to be exempt from post import testing will be phased out by the end of December 2010, and importers will be required to meet the cost of post import testing (as for movements from high incidence areas in GB). New legislation to ban deer hunting with dogs is expected to be introduced before the Dail rises for summer, Minister for the Environment John Gormley has said. Mr Gormley today published the Wildlife (Amendment) Bill, which will prohibit deer hunting with packs of dogs and will increase the maximum fines for other wildlife related offences. The Co Meath-based Ward Union Hunt will be the only group affected by the ban. “The Government has decided that this particular hunting practice should cease for animal welfare and public safety reasons,” Mr Gormley said. He said he believed the Bill would have large public support and said it would have no implications for other country pursuits such as fox-hunting, hare-hunting, hare coursing or deer stalking. Fines under the Wildlife Acts are being increased from €500 to €1,000 for a first offence on summary conviction, from €1,000 to €2,000 for a second and from €1,500 to €5,000 for a third or subsequent offence. The maximum fine for conviction on indictment would be doubled from €50,000 to €100,000. These fines were last increased in 2000. There are no changes in maximum times of imprisonment terms, which range from three months for a first offence up to a term not exceeding two years for those convicted on indictment. Pro-hunt supporters Rural Ireland Says Enough (Rise) today vowed to fight the ban and continue lobbying TDs and Senators. Rise spokesman Liam Cahill said Mr Gormley still had a long way to go before the Bill becomes law. “He has many legislative hurdles to overcome and we’ll be vigorously resisting it at every step,” Mr Cahill said. Mr Cahill said there were more deer killed by motorists in Phoenix Park than in the hunt. He also said every hunt conducted has been closely monitored by Government inspectors and no animal welfare issues have arisen. However, Irish Council Against Blood Sports campaign director Aideen Yourell welcomed the publication of the Bill and said it "marks a historic day in the campaign against blood sports in Ireland". The banning of the Ward Union will be welcomed by the compassionate majority who abhor cruelty and the terrorisation of animals for "sport", the organisation said. TWO MEN have been remanded on bail after they were charged with 100 offences relating to the alleged interference with the testing of cattle for bovine tuberculosis at their farm in west Cork. Brothers Maurice Power (48) and Gerard Power (43), Ballyvolane, Ballinadee, Co Cork, appeared at Bandon District Court yesterday where they each faced 50 charges relating to the testing of cattle at their farm between March 31st and April 3rd, 2008. Garda Insp Brendan Fogarty said the State would allege that the Powers were not happy when department inspectors tested the herd on March 31st 2008 and reported that three animals had tested positive for bovine TB. The State would say that when inspectors returned a few days later to check on the results of the tests on other animals, they carried out further tests and found that another 56 animals tested positive for bovine TB, giving rise to suspicions of interference. All 59 animals had to be removed for slaughter. It was alleged that there had been some interference to mask the incidence of TB as result of injecting some foreign body into the animals, he said. Each man is charged with 25 counts of introducing a substance into the body of an animal for the purpose of interfering with the TB test. Each man is also charged with a further 25 counts of failing in their duty as the owners of the animals to take such care of them so as to prevent the introduction of a substance which would interfere with the TB testing. Insp Fogarty told the court the DPP had elected for summary disposal at a District Court but it was a hybrid offence and the judge had power to decline jurisdiction so he gave an outline of the case for Judge James McNulty to decide. He said it was a complex case which followed a lengthy investigation by Department of Agriculture officials, led by veterinary inspector Brian Flaherty, which revolved around the testing of animals in the Powers’ herd of 124 cattle. sp Fogarty said the penalty for the offence in the District Court was a fine of €1,500 on each charge and/or 12 months imprisonment while, if dealt with by indictment at Circuit Court level, the penalty was €100,000 on each charge and/or five years in jail. Solicitor for the Powers, Albert Woulfe, said his clients, whose stock had been decimated and who had received no compensation for the animals removed from their In mother’s 75-acre holding, vehemently denied the accusations and would be contesting the matter fully. Upon hearing an outline of the alleged facts of the case, Judge McNulty refused jurisdiction whereupon Insp Fogarty applied for an adjournment to allow for further consultation with the DPP. The case was adjourned until March 19th. Another victim of an illegal snare. This badger lost the fight for survival even though her rescuer managed to get veterinary help alas it was too late and she succumbed. The picture tells it’s own story. She was caught in an illegal snare. How long had she struggled in her attempts to free herself, hours, maybe days? Imagine the pain and fear. Sometimes the animal may not be removed at all but left to die a lingering death. 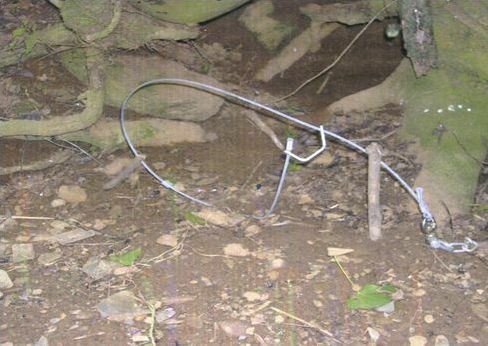 Snares which are notoriously indiscriminate may also be used by gamekeepers on shooting estates to trap so-called predators The level of suffering inflicted on badgers, foxes and wildlife in general through the sick practice of snaring is horrendous. The above situation might have been worse had she been lactating. In this case an entire little family would have perished with her. Illegal snaring, the scourge of our countryside is an impossible task to cope with due to the remoteness of rural areas. Illegal they may be but our conservation rangers simply lack the resources to deal with this problem. They cannot be everywhere. By and large the sighting of snares are usually reported by concerned individuals who have accidently come across them and sought help.